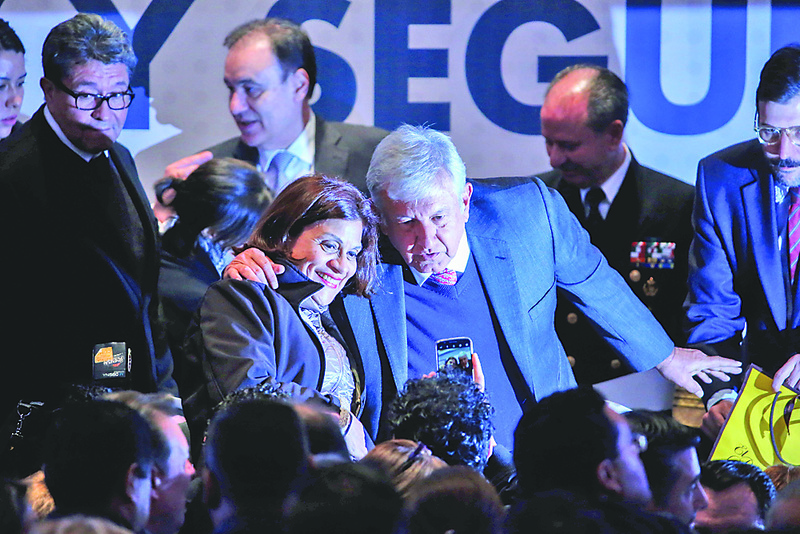 Anthony Vazquez | The Associated Press Mexico's President-elect Andres Manuel Lopez Obrador has a photo taken with a member of the audience during the national peace and security plan conference Wednesday in Mexico City. But a new majority is set to take over the U.S. House of Representatives, and a new president is about to take office in Mexico. 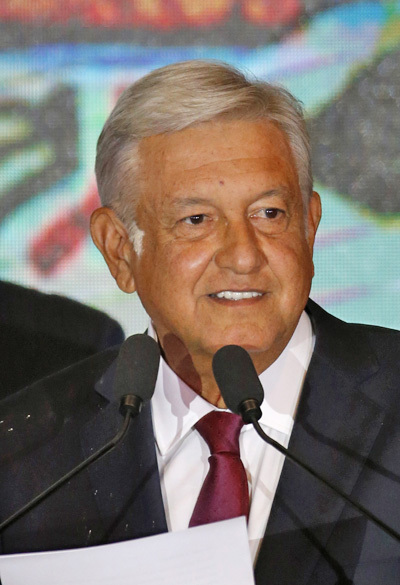 Andres Manuel Lopez Obrador, a leftist, will likely move the country in a different direction. “Going back to the 80s, Mexico’s essentially had a center-right government,” said Tony Garza, the former U.S. ambassador to Mexico, now counsel to the law firm White and Case in Mexico City. Garza is also a Brownsville native. “Now you have a very different kind of president,” Garza added. Lopez Obrador might try to turn Mexico back to a bygone generation, analysts predict. “When Andres Manuel takes over the presidency, he will begin to implement his plans for returning Mexico to what he sees is a golden era,” said Duncan Wood, director of the Washington-based Wilson Center’s Mexico institute. Wood recently spoke at the McAllen Convention Center. “Andres Manuel is deeply steeped in history,” Wood said. Lopez Obrador won the election in July, and will take office in December. Since his victory, most of the attention on Mexico has been related to immigration. Central Americans, for years, have been crossing into Mexico without much trouble, and making their way to the U.S. Recently, Trump has highlighted it. Trump has criticized Mexico’s lack of attention to its southern border as caravans of Central Americans have crossed through. Immigration will be one of Lopez Obrador’s many challenges. Immigration has also been a challenge for Trump. The two countries, and Canada, recently agreed to a new version of the North American Free Trade Agreement, calling it the U.S.-Mexico-Canada Agreement. Nothing has been ratified yet. The Democrats taking control of the House in the U.S. could potentially complicate that. Lopez Obrador could, too, though he does not appear to have plans to do anything radical with the updated trade treaty. Mexico has also been plagued with extreme violence for years, much of which has been related to the drug trade. “It is a country torn apart by violence,” Wood said. Perhaps nowhere is more violent than northern Mexico, on the U.S. border, where transnational criminal groups control many of the crossing points along the Rio Grande. Violence will be one of Lopez Obrador’s top challenges, and one he could possibly work with Trump on, if the two get along. Some members of both the American and Mexican Congresses are trying to strengthen the relationship. U.S. Rep. Henry Cuellar, D-Laredo, has long been active in trying to further the friendships between the countries. A group of U.S. members of Congress will be in Mexico City to welcome new Mexican members of Congress, Cuellar said. A delegation from Mexico will be in Washington to do the same, when the new Congress takes their oaths in January. “I can’t remember that happening,” Cuellar said in a recent interview. But signs of respect will have to find their way to the upper echelons of power in both countries, something Trump has shown little indication of displaying.